John David Weathers was born on September 25, 1969 in Lawrenceburg, Tennessee. Weather was drafted by the Toronto Blue Jays in the 3rd round of the 1991 draft. The six foot three right hander was a journey man pitcher who pitched in the big leagues for 19 years. Weather is only the twentieth pitcher in history to appear in over 900 games. His long career began in Canada, & after two brief seasons in Toronto he became a starter with the Florida Marlins going 8-12 in 1994. 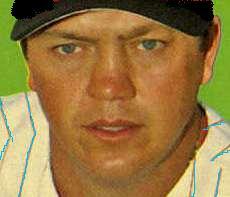 He eventually became a full time middle inning reliever by 1996, and would land in New York (A.L.) 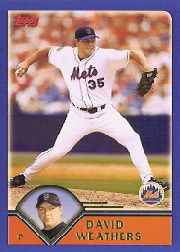 Cleveland, Cincinnati, Milwaukee, and Chicago (NL) until he landed in with the New York Mets in 2002. He arrived via free agency and found a spot as a solid middle reliever having one of his best seasons going 6-1 with a 2.91 ERA. On Opening Day he got credit for the hold in the Mets 6-2 win at Shea Stadium against the Pittsburgh Pirates. In the month of April he made 12 appearances with three holds, a blown save & earning himself two victories. Weathers became a workhorse already having 12 holds in 44 appearances by the All Star Break. In late July he got credit for two wins in a three day span in Chicago & at home against the Montreal Expos. In the final three months of the season he won three games, got credit for eight holds & only blew one save which came on September 24th at Pittsburgh against the Pirates. For the season Weathers struck out 61 batters in 77 innings posting a .667 winning percentage. 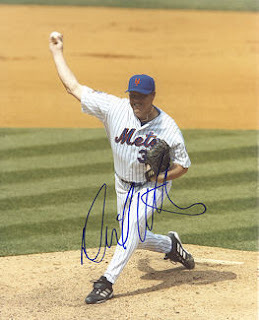 In 2003 he wasn’t as effective, as he dropped to 1-6 with a 3.08 ERA in 77 appearances, although he struck out 75 batters in 84 innings pitched. In 2004 after 32 appearances, he was 5-3 with an ERA of 4.28 in June when he was traded along with Jeremy Griffiths to the Houston Astros for Richard Hidalgo. For the remainder of the season he pitched in both Houston & Florida. In 2005 he went to the Cincinnati Reds and found a spot as a quality closer for four seasons. In 2005 he was 7-4 with 15 saves & a 3.94 ERA. In 2007 he saved 33 games (7th in the NL) and led the league finishing up 60 games posting a 2-6 record with a 3.59 ERA. He was still active at age 40, pitching moving on to the Milwaukee Brewers going 1-3 with a 4.88 ERA in 2009 before retiring. Lifetime Weathers pitched in 964 games in 1376 innings, going 72-87 with 75 saves 976 strike outs 604 walks and a 4.53 ERA.